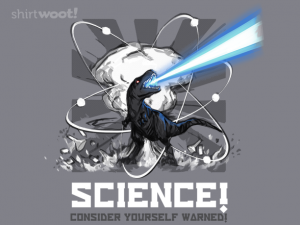 You’ve gone your whole life so far without having to worry about running into a dinosaur with laser breath, but nothing can prepare you for the possibilities of gene splicing or the addition of atomic radiation to the genome or the DNA strand or whatever. Listen, all I know is that science is here to warn you about everything that could happen and all the things that have happened. A scientist’s job is basically to observe and report, and based off those observations, one can pretty accurately predict future reactions. If you blow up Hiroshima with an atomic bomb, the same bomb going off in New York City is NOT A GOOD IDEA. Not that Hiroshima was a good idea… just… you know what I mean. BE WARNED!